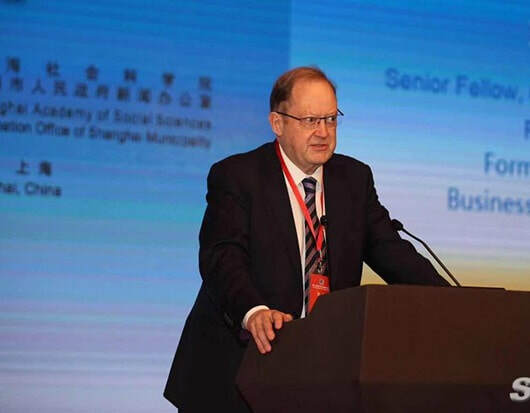 The following speech on why China’s economic, geopolitical and foreign policy thinking is the world’s most advanced, and on certain features of Chinese classical culture and its relation to the modern global order, was given by me to the 7th World Forum on China Studies in Shanghai. First, thank you very much for the invitation to speak for which I am greatly honoured. Not all rivers are the same size of course. Of those that have flowed into the ocean of human civilization China’s is certainly one of the largest. But, as China itself states, its river has not flowed at all times with the same strength. As everyone here knows, from the fifth decade of the 19th century the river of China encountered many blockages and problems. At that time, therefore, the flow of China’s river into the ocean of human civilization was also weakened. Today, thanks to immense sacrifices by the Chinese people and the leadership of the Communist Party of China, that river is again running very strongly through China’s own territory. But therefore, as will be discussed here, it is flowing increasingly powerfully into the general ocean of human civilization. Because I know I am speaking in front of many distinguished Chinese and international experts on China I would like to divide my speech assessing some aspects of this into two parts. The first part is my specific area of professional competence – economics. This is not only the great impact of China on the global economy but a simple considered statement – that China’s economic thinking is already the most advanced in the world. The second, as someone who came to be interested in Chinese culture 52 years ago not through economics but through Chinese poetry, I hope to make a few brief non-professional, but I hope intelligent, comments on the reasons why the global impact of Chinese culture and philosophy will also greatly increase. I hope by doing so also to justify another considered statement – that China’s geopolitics and foreign policy thinking is the most advanced in the world. Finally, I hope to show why these aspects are interrelated. China’s economic thinking is the most advanced in the world. First, to deal with the obvious impact of China, and its ‘New Era, New Thought, New Journey’, let us note the significance of the regrettable fact that I have to deliver this speech in English – for which, as there are many foreigners at this conference who speak fluent Chinese I have to deeply apologise! But this reality also shows the enormously growing impact of China. For many years the Chinese economy was an object of study outside China only for specialists – whose first skill was precisely their knowledge of the Chinese language. These specialists were naturally varied in their output. Some produced extremely valuable books. Some regrettably are still active today ‘bad mouthing’ China and predicting disaster in the Chinese economy despite the fact that China has produced the greatest economic growth over a sustained period in the whole of human history. But they shared a common feature that the study of China’s economy outside China was not part of the mainstream of economics. If I may recall a personal experience, I vividly remember in 1992 publishing an article in English and Russian ‘Why the Economic Reform Succeeded in China and Will Fail in Russia and Eastern Europe’. This was based on careful study of Deng Xiaoping, Chen Yun and available material outside China on China’s economic reform. The reaction of the most people in the West was ‘why are you so interested in China? It is a poor country, it is not a very big economy.’ And in 1992 those latter remarks were true. Facts proved which of these analyses was correct. China, developing the theory of a ‘socialist market economy’ underwent the greatest sustained economic growth in a major country in human history. Russia, under the influence of Western economic theories which were counterposed to China’s, underwent the greatest economic collapse in a major economy in peacetime since the Industrial Revolution – with a decline of GDP of 39% in seven years. The theory of economics does not recognise national boundaries nor is it the monopoly of any one language. To accurately predict what would happen it was possible to make up for very poor knowledge of the Chinese language with good economics! Twenty-five years later of course no economist considers it strange to study China’s economy. Hundreds of articles appear every day in the media outside China about China’s economy. Numerous major economists write about China. A subject which 25 years ago was considered a ‘niche’ one outside China is now totally mainstream. China’s achievements are too great to need exaggeration. I have no romantic concept, and neither should any serious scholar, that ‘China is the best in the world at everything’. If you are a physicist, for example, top prize is still held by a German, Einstein, and a Britain, Newton. But in the field of economics it should be stated bluntly that China’s unparalleled economic development, China’s ability to avoid the disaster produced in the former Soviet Union by Western economic ideas in ‘shock therapy’, and China’s ability to come through the international financial crisis without any setback comparable to that in the major Western economies confirms that China’s economic thinking is already the most advanced in the world. I will also outline later why the same applies to foreign policy and geopolitics. In short, it is the tremendous success of China’s economy that has taken study of China’s economy from being a niche speciality to being one of the most important and mainstream issues in economics. The same process is going to take progressively take place in other subjects – I am just able to follow it most closely in economics. This process, I believe, also explains what a foreigner can contribute to one of China’s most important new think tanks, Chongyang Institute for Financial Studies, Renmin University of China – where I work. Obviously, as I have been writing on the issue for 25 years, I have by Western standards a good knowledge of China’s domestic economy, but I would immediately state that many Chinese economists have a more detailed knowledge of its domestic economy than any foreigner. The areas where a foreigner can particularly contribute are on the relation of China and the international economy and on issues of economic theory. Foreign policy and geopolitics.For the second part of my speech, I hope I may be permitted to make a few non-professional, but I hope intelligent, observations on other issues and why I believe they relate to more professional issues of foreign policy and geopolitics. As I stated my own intellectual engagement with China did not begin with economics, it began 52 years ago with poetry. At university I read in translation Li Bai and Du Fu and was fascinated by their reflection of Chinese culture and by certain key ideas which were different to own European ones. Only more than 40 years later, aided by the impact of living in China, could I work out clearly why. China is unique in that it is the only one of the powerful civilizations that is not founded on a religion. All the others – Christianity, Islam, Hinduism, Buddhism, Judaism – are religions. Confucianism is not. It is a system of social values. This interacts deeply with China’s current reality and aids China’s role in another field in which China has the most advanced ideas – foreign policy and geopolitics. No one here with specific religious values should be insulted, but it is clear a truly global system of organisation cannot be based on a religion – because there is a disagreement as to which religion is correct and there are a large number of people who are not religious. Therefore, a global order must itself be based on social values not on a religion. This fact that China is uniquely the one great civilization based on social values and not a religion gives it an advantage in thinking about a global order. In short, China’s fundamental concept of foreign policy and geopolitics is simultaneously of equality and diversity. This is fundamentally different to the hierarchical concept of ‘one nation superior to others’ of, for example, the US neo-cons – who, because of this concept of a hierarchy, also aim at uniformity in which all nations should aspire to a single model, namely their own. It could be demonstrated that this formula of ‘equality and diversity’ is also present in European philosophy – for example in Spinoza, Leibniz and Hegel. But Xi Jinping shows the deep roots of this concept in classical Chinese thought. The concepts of China’s traditional philosophy and morality therefore integrate with economics in a way no other countries does. This is why, from a fundamental point of view, the attempt to integrate Confucianism and modern reality is not artificial. It is therefore in these areas – of economics, foreign policy and geopolitics – that China’s thinking is already the most advanced in the world. For reasons outlined China’s classic thinking is not an obstacle to this but an aid. It reflects what I believe is a profound reality – that China is simultaneously the oldest country in the world and the most modern. But these words can also be seen from another angle – inevitably so by someone who is a member of humanity but not Chinese. The great German Philosopher Hegel noted that at a particular moment in history the general progress of humanity becomes determined by a specific country. This meant that the pursuit of the progress of a particular country is decisive for the progress of the whole of humanity. Russia that was not only one of the greatest events in world history but hastened the fall of all colonial Empires – and had a decisive effect on China itself. Today, in equal measure, the greatest step that can be taken not only for China but for all humanity can only be taken by Chinese people, on Chinese soil, and in pursuing a Chinese Dream.